The C-Aircross concept (shown) takes design inspiration from the new Citroen C3, the automaker's top-seller in Europe last year, with features such as the split-level front lights and a version of the door-mounted airbumps first seen on the larger C4 Cactus. Citroen will reveal a small SUV concept at the Geneva auto show next month that previews a future rival to the Renault Captur and Fiat 500X as well as a replacement for the C3 Picasso in the shrinking subcompact minivan segment, the automaker said. The C-Aircross “heralds Citroen's global offensive in the SUV sector” the automaker said in a statement, implying the small SUV would also be sold outside Europe. Citroen didn't say when the production version would be launched, but press reports predict the SUV will arrive in late autumn this year. 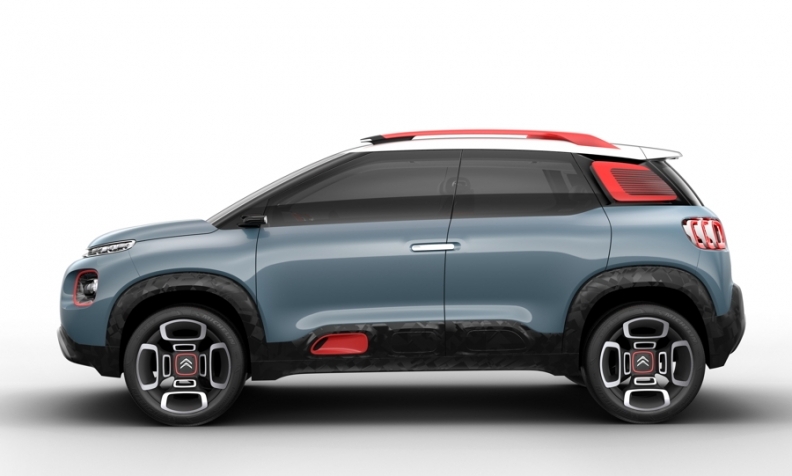 The concept takes design inspiration from the new Citroen C3, the automaker's top-seller in Europe, with features such as the split-level front lights and a version of the door-mounted airbumps first seen on the larger C4 Cactus. Key features on the concept include rear-hinged back doors, cameras in place of side mirrors and a rearview camera integrated into the roof spoiler. Citroen says the interior has been designed to be as comfortable and user-friendly as possible, featuring a head-up display, quilted Alcantara-covered seats, wireless phone charger and plenty of light. The steering wheel is single-spoke, a feature found on many of Citroen's previous models. Citroen's sales have suffered in recent years because it lacks a small SUV, which is in one of Europe's fastest-growing segments. Rival Renault is the segment leader with the Captur, which rose to 10th in overall European sales last year from 13th in 2015 with an 11 percent rise in sales to 216,395. The overall small SUV segment now tops more than a million sales in Europe, while demand for small minivans, where the C3 Picasso ranks among the top five sellers, has been on a steady decline, dropping the overall sector's volume to less than 350,000 last year, according to data from market research JATO Dynamics. The production version of the Citroen concept has been developed alongside the Opel/Vauxhall Crossland X, which will appear at the Geneva auto show and go on sale this summer. Opel will build the Crossland X, the production version of the C-Aircross concept and a Peugeot version of the small SUV at its plant in Zaragoza, Spain. The C-Aircross measures 4150mm long, 1740mm wide and 1630mm tall. All figures are similar to those of the Crossland X. The production C-Aircross will also share technology with the Crossland X, which Opel has said will include the head-up display, panoramic rearview camera and LED headlights. Opel has also said the car will have class-leading trunk space.